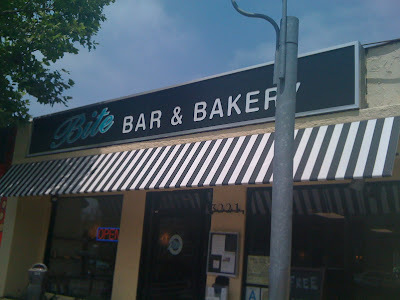 Bite Bar & Bakery opened a few months ago on Pico in Santa Monica, taking over the space of Jared Simon's small plates establishment Violet. I was sad to see Violet shutter but glad that another restaurant (instead of a commercial shop) was taking its place. Bite was commented to death on Chowhound, everyone raved about their croissants. As a self proclaimed croissant crack addict, I had to go see for myself. Although I've been meaning to check it out, it was tough to coordinate brunch plans with friends given our busy weekend schedules. Despite that, I've managed to make it to Bite twice to-date, none of which was planned. The 1st time, I was driving back from surf and in order to circumvent traffic, I decided to roll home via Pico Blvd. As I was approaching Bite, I though.. should I stop?!? Heck yeah! 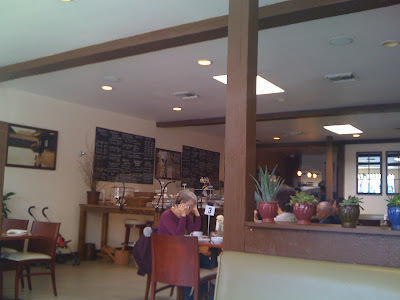 The restaurant is inviting, the kind of place you would feel comfortable grabbing a newspaper and having a quiet breakfast by yourself. 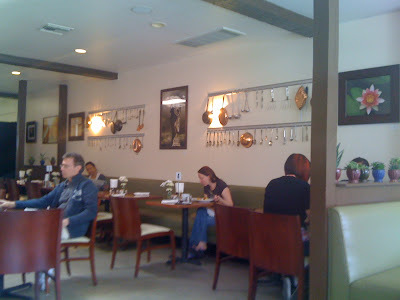 Metal kitchenware decorate one of the walls. Bite currently serves breakfast and lunch, with dinner and a wine bar coming soon. They use fresh ingredients from the Farmer's market, and everything is made fresh in their kitchen. 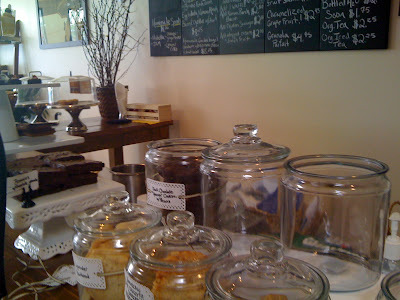 You order at the counter which is line with fresh baked goods. Menu items are listed on the chalkboard including some daily specials. The chicken pot pie caught my eye but I got there before lunch service. Unfortunately there were no croissants left and only one pain au chocolate which I quickly snagged to go. The lady at the counter put it in a paper bag and I decide to sit at a table in the corner to scarf it down. I'm not going to feel bad, I just burnt off many calories in the ocean. Despite rave online reviews for their pain au chocolate, I was disappointed. It was cold, not flaky or buttery, tasted a bit doughy inside, and for $3 it was tiny! Honestly, it was the size of the croissants in Paris that my sister would buy for her 2 year old kid. I've rarely seen this tiny a version Stateside. I walked away let down and even posted a short entry on CH to share my views, wondering why numerous other people had a different experience with their croissants. After this, I wasn't as eager to arrange brunch plans with friends at Bite anymore. But just this weekend, I was in the area again. Post surf, I headed over to the Farmer's Market on Pico to check out their produce. 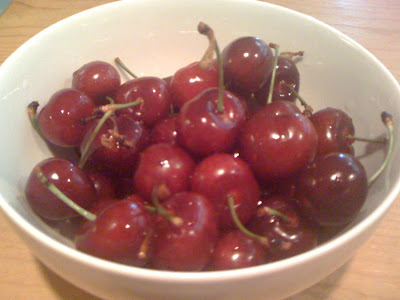 Cherries were fresh and not too sweet. I try to support local farmers if I can but it ain't that cheap at $4 for a small basket. As I left the Farmer's Market, I thought to myself.. Bite is a couple blocks away, should I give it another shot, should I stop? Hmm only if there's parking. As I cruised by, I saw prime parking in front of the restaurant. I flipped a B and parked. It's a sign, Bite is calling me back. FYI you'll most likely always find parking because there aren't that many business and foot traffic in the area. 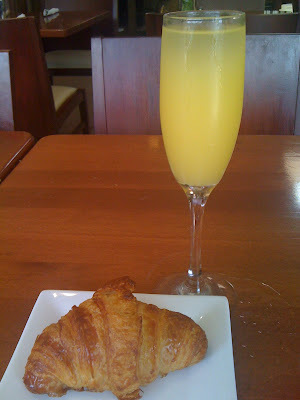 This time, it was later in the morning but they had more croissant available than during my first visit. Perhaps they knew to make additional batches to keep up with demand. It was also lunch time. Unfortunately they no longer offer the chicken pot pie. Apparently people weren't ordering it because it required a wait of 25 minutes and was too high maintenance a dish. I was bummed because I had read some good reviews of the pot pie. I decided on the next best thing, the toasted crab sandwich. They now offer mimosa and belinis at $6. I asked how long the crab sandwich would take- 10 min. In that case, I'll take a mimosa and a croissant while I wait. The woman at the counter offered to heat up the croissant. best. decision. ever. The croissant smelt great. It was flaky on the outside and I slowly pulled apart the warm, tender ribbons in the inside. They really were similar to the ones that are freshly baked from a Parisian bakery. The inside was well seasoned and buttery. Similar to the pain au chocolate, it was a petite size but was surprisingly sufficient because of its richness. I would venture to say that this was really authentic, and after devouring numerous croissants in Paris, I think I am a good judge. 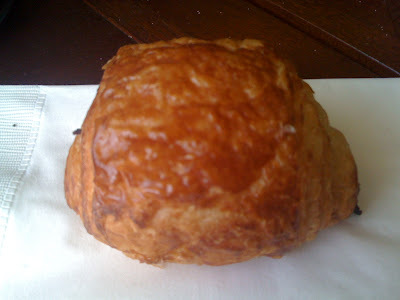 I wonder now if the pain au chocolate that I had during my first visit would have been better if they had warmed it up. You definitely should request it warm as it is a world of a difference. 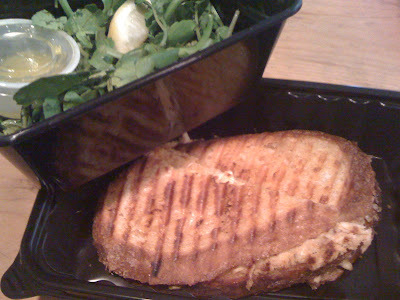 I ordered the crab sandwich to go and they packaged the watercress separately. When I was ready to eat, I assembled the watercress in between the crab and the bread. When the lady at the counter mentioned that it was kindda like a crab salad, I was nervous because I don't like too much aioli or mayo. Thankfully the crab wasn't mixed with a whole load of aioli but had just enough to bind the crab together. The crab was abundant, fresh and not at all fishy. It was moist and the paprika aioli added a nice flavoring. 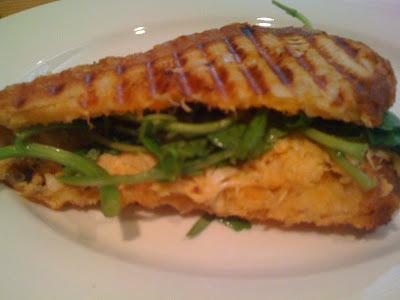 The panini was pressed thin and the sourdough bread was toasted crispy and buttered. There's something so special about buttered toast. The watercress salad was fresh and lightly dressed with a lemon dressing with an additional squeeze of the lemon wedge. The sandwich was a rather sizable portion. I was only able to eat half of it despite being famished from an ocean workout. I was completely wowed with this sandwich. I'm a convert! I am so glad I decided to give Bite another shot because I left very impressed. The croissant was everything that Hounds raves about. Yes, we are now on the same page. The crab sandwich was absolutely delicious. Every bite melt in my mouth. I can't express how excited I am about the rest of their menu (hello eggy bread sandwich with maple french brioche with egg frittata, Niman Ranch bacon and Tillamook) and their upcoming dinner and wine bar offerings. 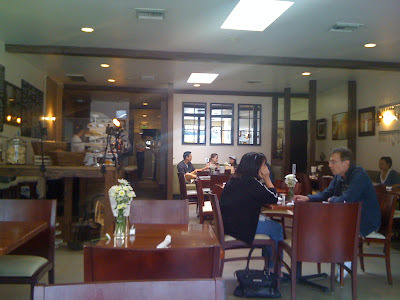 This is truly a neighborhood gem that I'd like to make my usual weekend brunch spot because sometimes, all you need is a glass of mimosa and a buttery croissant. Oh Diana, you'll love it there. Lots of chocolatey stuff available! Yes! I bought one of those coupon deals for this place, glad to hear that it's good :) Can't wait. burumun, can't wait to hear what you think of it! wish I had a coupon, I'd use it to stock up on all their pastries!